- Do all employers read cover letters? - Does that mean that writing a cover letter is a waste of time? The truth of the matter that no job seeker was rejected simply because he/she had a cover letter. It is true that some HRs don’t like to spend extra time reading them. However, you never know if your prospective employer is of that kind. Because there is another category of employers who do read cover letters. And for some, this one-page document tells more than a resume. Therefore, we recommend job seekers submit cover letters unless requested otherwise (for many job postings it is one of the requirements). There are many questions in regard to the cover letter writing process. Which cover letter format works best? How long should a cover letter be? How to address a cover letter? This article is meant to demonstrate what effective cover letters look like as opposed to tell you how to develop one. If you are interested in the writing guide, please check our cover letter writing tips article. Below you will find cover letter examples written for different career levels so we hope you will find the sample that reflects your skill set and matches your career goals. Most people don’t know what to include in a cover letter for internship. It is understandable since at this point there are no real accomplishments and often even no work experience. However, it doesn’t mean that candidates cannot use their educational credentials along with the skill set and commitment to prove employers they will be a good fit for the opening. 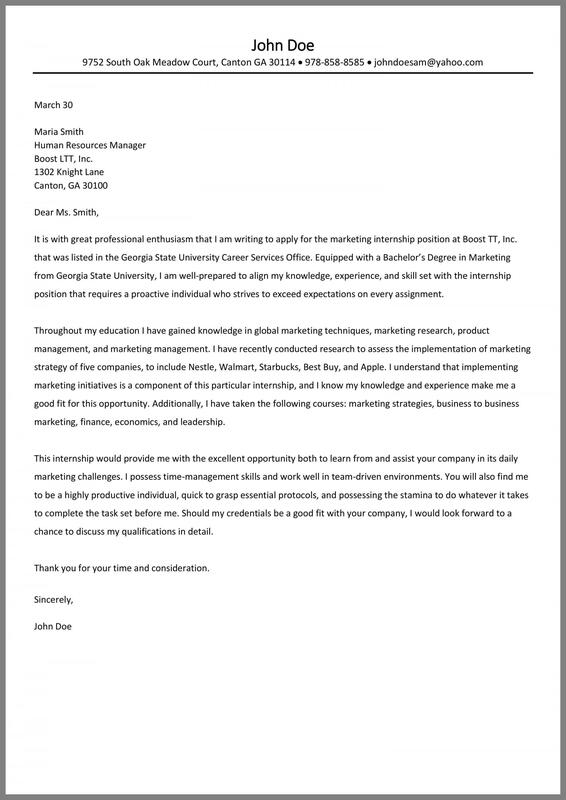 Check our marketing internship cover letter sample below to see how one can highlight relevant knowledge and skills in an cover letter for internship. Entry level cover letters either have little or no experience to show off at all. One might have had internship or one-two entry level jobs. The key is highlighting as much of relevant experience as you possibly can. 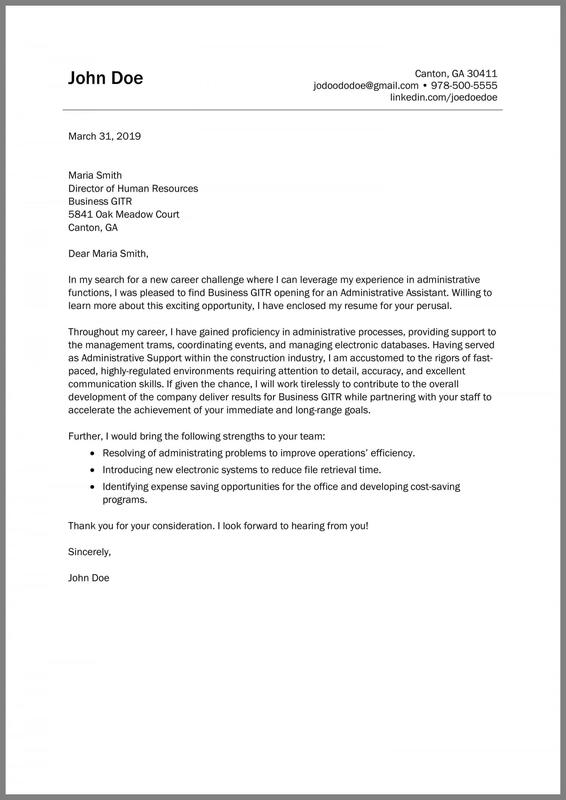 You can check our administrative assistant cover letter sample to understand how one’s background and skills must be emphasized in order to generate the interest of prospective employers. Middle level assumes some accomplishments to be listed on a cover letter. The more you show the results (not just routine duties), the more chances you have got to be invited for the interview. 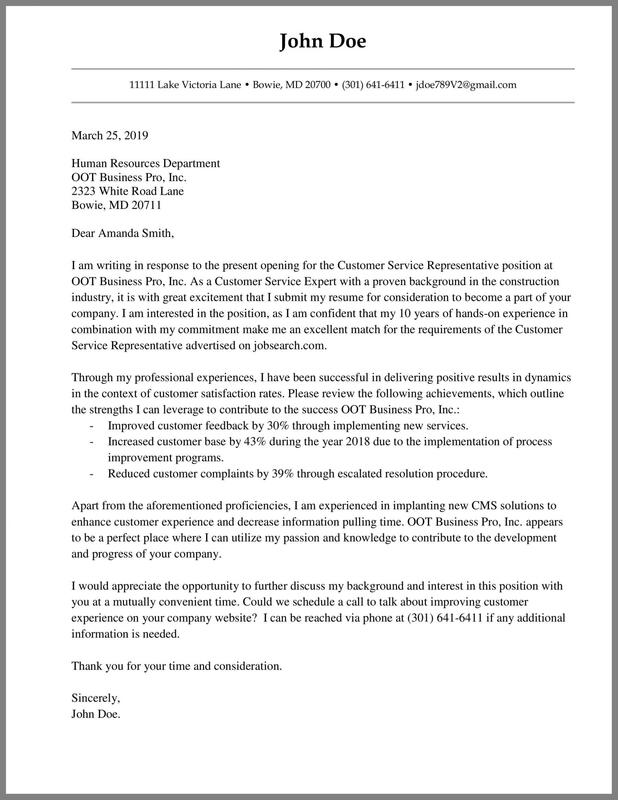 The customer service cover letter sample below demonstrates how middle-senior candidates should outline their accomplishments to get an interview invite. Executive level is similar to the previous one; the difference is the types of achievements that are to be mentioned in the document. Employers expect that executive level candidates can briefly explain what value they can bring to the organization. 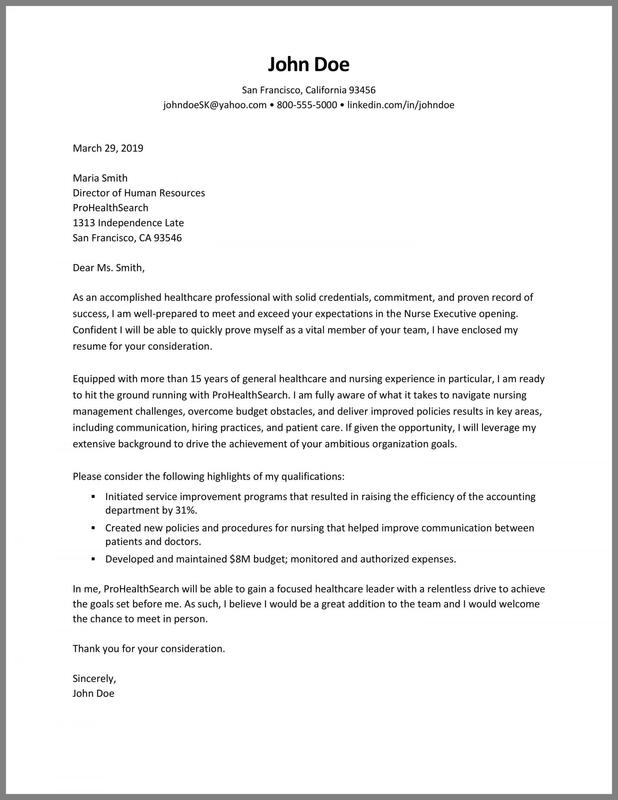 Check our nursing cover letter sample to see what executive candidates should say in order to attract the attention of prospective employers.